Statistics on the translation market consistently identify medicine as a major thematic area as far as volume or translation is concerned. 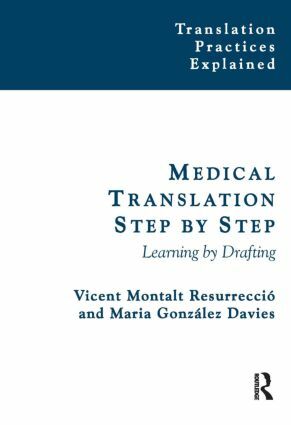 Vicent Montalt and Maria Gonzalez Davis, both experienced translator trainers at Spanish universities, explain the basics of medical translation and ways of teaching and learning how to translate medical texts. Medical Translation Step by Step provides a pedagogical approach to medical translation based on learner and learning-centred teaching tasks, revolving around interaction: pair and group work to carry out the tasks and exercises to practice the points covered. These include work on declarative and operative knowledge of both translation and medical texts and favour an approach that takes into account both the process and product of translations. Starting from a broad communication framework, the book follows a top-down approach to medical translation: communication → genres → texts → terms and other units of specialized knowledge. It is positively focused in that it does not insist on error analysis, but rather on ways of writing good translations and empowering both students and teachers. The text can be used as a course book for students in face-to-face learning, but also in distance and mixed learning situations. It will also be useful for teachers as a resource book, or a core book to be complemented with other materials.